To the recreational shooter, reloading a handgun is not cause for great concern, but for the competitive or defensive handgunner, it's a critical skill. An empty gun can cost a competition shooter a match and a gunfighter his life. As such, careful consideration and diligent practice must be devoted to reloading as efficiently as possible. One of the major advantages of a semiautomatic pistol over a revolver is the former's higher ammunition capacity. Not only are you reloading less often with a pistol, but also doing so is typically easier and faster, because a pistol simply requires the reloading of a magazine and the slide closed. But revolvers have always been popular defensive tools, so you need to know how to reload them most effectively. With a double-action revolver, the cylinder must be swung out, rounds must be loaded into each chamber (usually five or six), then the cylinder must be closed. Reloading a revolver one round at a time is absurdly slow, so you'll need something to enable you to load multiple rounds simultaneously. The most common reloading device for a revolver is a speedloader, which is designed to securely contain the prescribed number of rounds. Once the empty cases are ejected from the chambers of the revolver's cylinder, the speedloader is aligned with the cylinder chambers and a push or a twist (depending on the type) releases the rounds to fill each chamber of the cylinder. Not only does a speedloader make for much more efficient reloads, but also it contains your rounds for easier storage and faster access. You can carry one or more speedloaders in a belt-mounted pouch or in a pants pocket. Point the gun down so gravity helps the new rounds go in the cylinder holes. If using a speedloader, simply operate it and let it fall. Having a speedloader is one thing, but being able to use it in reloading your revolver quickly is quite another. Here's a look at a few of the many techniques developed for reloading with a speedloader. When I attended the police academy in 1996, we used semiautomatic pistols. However, a few years prior, during reserve peace officer training, we trained exclusively with revolvers. The technique I was taught for reloading was called the FBI method. It is executed as follows (for a right-handed shooter). After shooting the revolver empty, the right thumb activates the cylinder release. The tips of the middle and ring finger of the left hand force the cylinder open. The muzzle is then oriented upward and the left thumb depresses the ejection rod to release the empty casings. Next, the muzzle is pointed downward to expose the empty cylinder chambers. The right hand acquires the speedloader and loads the cylinder. Finally, the left thumb closes the cylinder and the gun is ready to fire. This FBI technique works fairly well, but it has a couple of drawbacks. Since it relies only on the leverage generated by the thumb on the ejection rod, empty casings may not fully eject. This may require fishing out empty casings to clear the chambers, which slows the reloading process considerably. Another issue is that it places your wrist at an awkward angle and makes it difficult to orient the gun vertically. If the muzzle isn't pointed due south, you'll be fighting a losing battle with gravity as you attempt to transfer the rounds from the speedloader into the chambers. There are different strategies for holding the cylinder and hitting the ejector rod during a full revolver reload, but regardless of how you do that, you want the gun pointed up so empties fall out easier. Fellow Handguns writer Dave Spaulding—who also runs Handgun Combatives training school—advocates a technique he calls the "beer can grip" because the left hand grips the cylinder as though it were a can of beer. You still use your left middle and ring fingers to force the cylinder open. From there, turn the muzzle upward and use your right thumb to lock the cylinder open. Strike the ejector rod with the heel of your left hand to eject the spent casings. Now, grasp the cylinder in a "thumb down" grip in one of two ways. Use either the tips of your fingers and thumb to pinch the top and bottom of the cylinder, locking it into place or insert your index and middle finger through the window of the frame and wrap your thumb around the bottom of the trigger guard. Now, orient the muzzle downward and load with your right hand. The advantage to this technique is that, unlike the FBI method, your left wrist remains in a strong, "locked" position and you can much more easily keep the gun up—allowing you to reload without lowering your gaze and potentially losing sight of your adversary. The beer-can reload can be modified for lefties. Use your left thumb to activate the cylinder release and your thumb or index finger to open the cylinder. Grasp the cylinder with your left thumb on top of the cylinder. Orient the muzzle upward and strike the ejection rod with your right palm. With your right thumb facing downward, insert your right index and middle fingers through the window of the frame. Reach under the trigger guard and grasp the bottom of the cylinder with your right hand. Point the muzzle downward and load with your left hand. Reacquire a shooting grip with your left hand as you release the cylinder with your right hand. Finally, reach underneath the frame and with the fingertips of your right hand, close the cylinder. An alternative to speedloaders is the speed strip, which is an easy and fast way to reload a gun that's not completely empty. Snubnose revolver trainer Michael de Bethencourt of SnubTraining.com espouses an unconventional technique he calls the "non-hand-transfer revolver reload." If you're right-handed, place your right thumb over the hammer (or where the hammer would be if it lacks one) and your right index finger, near the bottom of the cylinder. Your left index finger is placed below the cylinder and your left thumb manipulates the cylinder release. From there, your right index finger forces the cylinder open and continues to exert pressure to lock the cylinder fully open. In a palms-up motion, orient the muzzle upward and use the heel of your left hand to strike the ejection rod. With the cylinder empty, bring the revolver to your belt line with the muzzle pointed down. With your left hand, access your speedloader and load the cylinder. Use your left thumb to close the cylinder. The non-hand transfer technique enables you to keep the revolver in your shooting hand throughout the reloading process. While naysayers won't like the fact that this relegates you to using your less coordinated hand to load the revolver, don't you use your less coordinated hand to load a magazine into a semiautomatic pistol? Bringing the revolver to your belt facilitates a faster reload but will tend to bring your gaze down, which could significantly impair your situational awareness. If you load at the belt, be sure to keep your head up. Since cylinders only swing left and cylinder releases are on the left side of the revolver, the non-hand-transfer revolver reload technique doesn't work for lefties. Instead, de Bethencourt teaches the following technique for southpaws. The first step is to place your left thumb on the hammer (or where the hammer would be if there was one) and your left index finger below the cylinder. Next, rotate the gun clockwise 90 degrees. Place your right index finger on the cylinder and activate the cylinder release with your right thumb. Keep the gun in front of your face. One, it helps you see what you're doing, which makes the reload easier. Two, it allows you to be looking downrange or toward a threat even as you reload. Force the cylinder open and point the muzzle upward. Insert your left thumb through the window of the frame and hit the ejection rod with the heel of your right hand. Replace your left thumb with your right and pinch the ejection rod between your right index and middle fingers. Bring the gun to your belt and reload as indicated in the non-hand-transfer revolver reload. Speedloaders require the cylinder be completely empty. What if you need to load only two or three rounds? You're going to have to dump the rounds remaining in the cylinder to make room for the new ones. That's when a speed strip comes in handy. A speed strip is a flexible rubber strip that aligns spare rounds one behind the other. If you have a speed strip, you can open the cylinder, partially depress the ejection rod, and remove the spent casings (live rounds drop back into the cylinder while empties will stick out). You can load one or two rounds at a time then rotate the cylinder to load additional rounds as required. I use a speed strip the way Massad Ayoob does, which is to load the strip to one less than capacity. This leaves something for your middle finger to hold onto as you grasp the speed strip the way a surgeon would hold a scalpel, with your index finger along the back of the strip. When you insert a round or two into the cylinder, press forward in line with the strip to peel the rounds free as they enter the chambers. As with the revolver, there are different techniques used for reloading a semiautomatic pistol. Initially, I was taught to reload with my arms extended and the muzzle pointed downrange/toward the threat. The problem with this technique is that it's much more difficult to reload with the pistol held away from your body. Nowadays, most shooters bring the pistol closer to the body, where they have more dexterity. When a pistol is empty and the slide locks to the rear, you need to immediately perform a speed or combat reload. If you're a right-handed shooter, press the magazine release with your right thumb, then cant the gun so that the magazine well faces your left. Grab a fresh magazine, with the base plate deep in your palm and the tip of your index finger just below the top round. Insert the magazine into the pistol, using the palm to seat it fully. At this point, you can depress the slide release or rack the slide. Using the slide release is faster, but manipulating the slide is more reliable. To conduct a speed reload left-handed, hit the magazine release button with your left index finger then cant the weapon so the magazine well faces your right. Acquire a fresh magazine and reload as previously described. 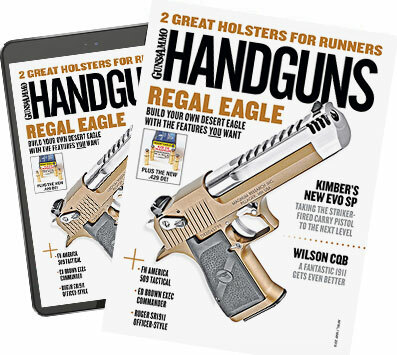 Since both thumbs will be on the right side of the pistol, you'll either have to use your left index finger to press the magazine release or rack the slide with your right hand. Tactical reloads require a bit of manual dexterity in that you have to retain control of the fresh mag while removing the one that's in the gun. When you haven't fired your pistol completely empty but want to ensure it's fully loaded, a so-called tactical reload is in order. Acquire a fresh magazine and cant the pistol as though you were conducting a speed reload. Strip the partially depleted magazine from the pistol using your index and middle fingers then immediately insert the fresh magazine into the pistol. Store the partially depleted magazine somewhere you can get to if you need it. Regardless of the type of handgun you carry, it makes sense to carry a speedloader, speed strip or spare magazine as appropriate. Considering it's likely to take several rounds to stop a single adversary and you may face more than one, the need for spare ammunition and effective reloading procedures is clear. Practice with an unloaded gun and dummy rounds until you are proficient at reloading your carry gun or home defense gun. In a gunfight, marksmanship is only one piece of the puzzle. After all, even the best marksman can't win a gunfight with an empty gun.